PORTUGAL CAPTAIN Cristiano Ronaldo has climbed into the top 10 international goalscorers of all time with a strike against Sweden this evening. The Real Madrid star bagged two against Hungary last week to register his 69th and 70th goals for the European Championship holders, before following up with another in Portugal’s friendly with Sweden on Tuesday. It moves him above Irish footballing legend Robbie Keane on the list, with the Tallaght native managing 68 goals in 146 appearances during a stellar international career. The Madeira man was able to drift into the six-yard box to meet Gelson Martins’ clever cross, before neatly guiding the ball past a helpless Karl Johnsson. The goal moves him joint-ninth in the all-time goalscorers list, alongside Germany’s Miroslav Klose, and just six behind Brazil legend Pele. Ronaldo also goes joint-third in the European list, with only Sandor Kocsis (75) and Ferenc Puskas (84) having scored more. 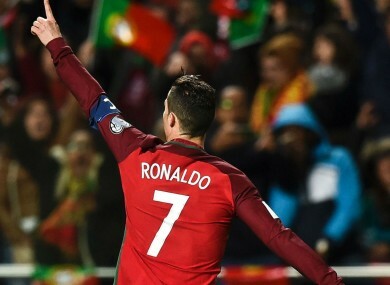 Thirty-six of Ronaldo’s strikes for his country have come at home, while 25 have been away and ten at final tournaments. From the 71 strikes, Ronaldo has hit three hat-tricks, plus one four-goal haul. There have been 12 doubles, with the remaining 33 goals coming as single goals. This evening’s goal caps off an exceptional few days for Ronaldo, following reports that he is set to have an airport named in his honour. The Madeira International Airport in his home country, is due to be officially renamed the Cristiano Ronaldo Airport on Wednesday in a special ceremony. Some local politicians have protested the move however, suggesting that his name should be added to a stadium or some other sporting venue instead. Additional reporting by Sinead Farrell. Email “Ronaldo moves into top 10 international goalscorers with this effort against Sweden”. Feedback on “Ronaldo moves into top 10 international goalscorers with this effort against Sweden”.